Elizabeth Wyman | The Journal Gazette Saint Francis' Austin Compton goes up for a shot against Indiana Wesleyan on Tuesday. Elizabeth Wyman | Journal Gazette Chandler White makes a move during a Saint Francis basketball game Tuesday night. The Cougars upset No.1 Indiana Wesleyan 85-71. Saint Francis' Austin Compton was simply having fun Tuesday night. 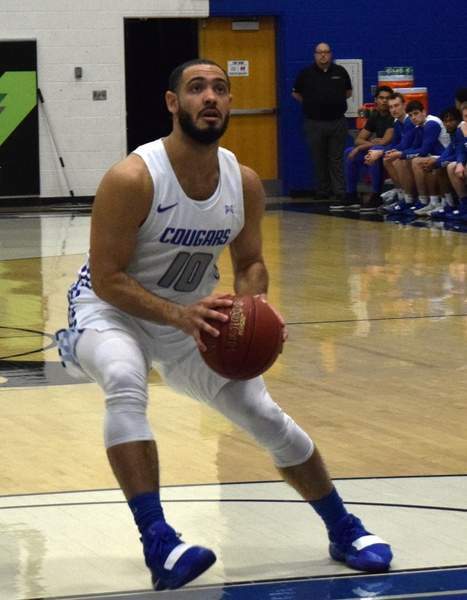 The junior guard hasn't ever had this much fun playing against Indiana Wesleyan because the Cougars had dropped their last eight meetings against the Wildcats and hadn't won since Compton was a redshirt freshmen. This was different. 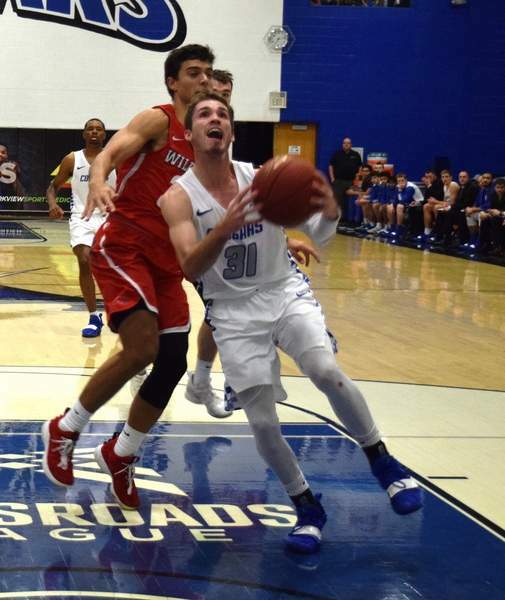 Saint Francis used its physicality and rallied behind Compton to upset the top-ranked Wildcats 85-71 on Tuesday at Hutzell Athletic Center. The win was even more unlikely after Saint Francis (7-5, 2-2 Crossroads League) suffered a 92-64 loss to No. 5 Marian on Saturday. Coach Chad LaCross said that's what he's most impressed with – his team's resiliency. The Cougars played like the No. 1 NAIA team in the first half. They locked down on defense, forcing eight Wildcats turnovers for eight points, holding Indiana Wesleyan scoreless for over six minutes and controlling the tempo. Indiana Wesleyan (11-2, 3-1 CL) plays through its two big men, brothers Evan and Seth Maxwell, who stand 6-foot-10 and 7-foot. Saint Francis has nobody on its roster taller than 6-7. Saint Francis forced Indiana Wesleyan to shoot 43 percent from the field and held them 22 points under their average of 93. Hunter Hollowell had the hot hand for the Cougars, going 5 of 6 on 3-pointers, including a big step-back 3 with 12:15 left in the game that ballooned the lead to 17. Hollowell finished with 19 points and nine rebounds. Indiana Wesleyan made a slight run early in the second half, connecting on its first four possessions, but Compton scored 19 of his 23 points in the second half, using his ball-handling skills to dribble around the Indiana Wesleyan big men. Warsaw graduate Kyle Mangas led the Wildcats with 15 points. The Saint Francis win came after the team fell out of the Top 25 NAIA rankings for the first time in 55 weeks. “This is my fourth year here and we've always been a top-10, top-15 team, and that was definitely a shock and upset a lot of people in our locker room,” Compton said.